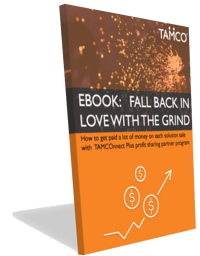 As of today technology solution provider’s utilizing TAMCOnnect Plus partner program are earning more money than you and doing the same amount of work. IPC Technologies assisted a high tech manufacturer in securing over $355,000 in their new voice solution with our operating expense (OPEX) lease, Shield. You too are eligible to take part in this new profit sharing program. IPC Technologies recently became a TAMCOnnect Plus partner; making them eligible to earn profit share bonuses just for their customers renewing at the end of their lease agreements. When the term for the recent tech manufacturer they won renews, IPC will be paid a renewal profit share bonus of $26,600. Finally, a customer that keeps on giving! We would think this is a worthwhile reason for maintaining customer relationships. I would bet to say no sales professional or AE ever decides to go into sales to be paid their base pay. So we decided to give them more of what they want. Money! Because the AE on this transaction recommended Shield, our OPEX lease agreement, he earned an added $3,000 in profit sharing bonus money. That went straight to his pocket. Start being one of our partners who earns more money than your competition. Learn more about TAMCOnnect Plus and the benefits it can bring to your business. Download our free ebook to learn more. FALL BACK IN LOVE WITH THE GRIND.